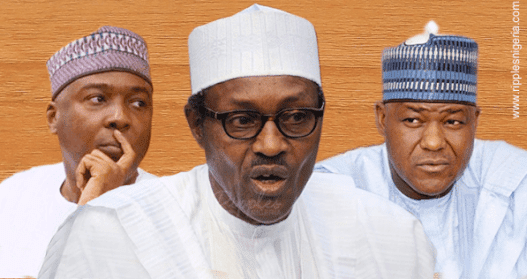 An end to the persistent feud between the presidency and the National Assembly appears to be around the corner with the ruling All Progressives Congress (APC) and the lawmakers setting up an 11-man inner caucus standing committee to deal with all the issues. The caucus comprises President Muhammadu Buhari; Vice President Yemi Osinbajo; Senate President Bukola Saraki; House of Reps Speaker Yakubu Dogara; Secretary to the Government of the Federation Boss Mustapha; Senate Leader Ahmad Lawan; and House of Reps Majority Leader Femi Gbajabiamila. The rest are APC National Chairman, Chief John Odigie-Oyegun, Deputy National Chairman (North), Alhaji Lawan Shuaibu; Deputy National Chairman (South), Engr. Segun Oni; and the National Secretary, Alhaji Mai Mala Buni. The Nation gathered that the committee is expected to be a proactive type and is charged with the responsibility of curbing friction between the two arms of government. Dropping of the nomination of Mr. Ibrahim Magu as the candidate for the chairman of the Economic and Financial Crimes Commission (EFCC).